NB: I have highlighted some of the important concepts in the statements below. For Eastern Catholics, please notice No. 25. Hopefully this will help everyone in the East move forward. “The grace of our Lord Jesus Christ, and the love of God, and the communion of the Holy Spirit be with you all” (2 Cor. 13, 13). 1. By the will of God the Father, from whom every gift comes in the name of our Lord Jesus Christ, the assistance of the Holy Ghost the Comforter, we, Francis Pope and Kirill, Patriarch of Moscow and All Russia, met today in Havana. We give thanks to God, glorified in the Trinity, for this meeting, the first in history. It is with joy that we have met like brothers in the Christian faith who encounter one another “to speak face to face” (2 Jn 12), from heart to heart, to discuss the mutual relations between the Churches, the crucial problems of our faithful, and the outlook for the progress of human civilization. 2. Our fraternal meeting took place in Cuba, at the crossroads between North and South, East and West. On this island – the symbol of hope, “the New World” and the dramatic events of the twentieth century history – we pay our word to all the peoples of Latin America and other continents. The powerful religious potential of Latin America, its centuries–old Christian tradition, grounded in the personal experience of millions of people, are the pledge of a great future for this region. 6. Aware of the many obstacles to be overcome, we hope that our meeting will contribute to the attainment of God-commanded unity for which Christ prayed. Let our meeting inspire Christians around the world with a new zeal to call upon the Lord, praying for the full unity of all his disciples. Let it – in a world that expects us not only words but also deeds – will be a sign of hope for all people of goodwill. 7. The determination to make all the necessary in order to overcome historical differences we have inherited, we want to combine our efforts for the testimony of the gospel of Christ and the common heritage of the Church of the first millennium, jointly responding to the challenges of the modern world. Orthodox and Catholics must learn to bear according to the testimony of truth in those areas where it is possible and necessary. Human civilization has entered a period of epochal change. Christian conscience and pastoral responsibility does not allow us to remain indifferent to the challenges requiring a joint response. 8. Our gaze is directed primarily to those regions of the world where Christians are persecuted. In many Middle Eastern and North African countries, our brothers and sisters in Christ are destroyed whole families, villages and towns. Their temples are subjected to barbaric destruction and looting, shrines – the desecration of monuments – destruction. In Syria, Iraq and other Middle East countries, we are witnessing the pain mass exodus of Christians from the land, which began to spread our faith and where they have lived since Apostolic times, together with other religious communities. 9. We call upon the international community to take immediate action to prevent further displacement of Christians from the Middle East. Raising your voice in defense of persecuted Christians, we empathize with the suffering and the adherents of other religious traditions, are victims of the civil war, chaos and terrorist violence. 10. In Syria and Iraq, the violence claimed thousands of lives, leaving their homes and means of livelihood for millions of people. We call on the international community to unite to put an end to violence and terrorism, and at the same time through a dialogue to facilitate early achievement of civil peace. We need a large-scale humanitarian assistance to the suffering people and the many refugees in neighboring countries. We ask all those who can influence the fate of all abductees, including metropolitans of Aleppo Paul and John Ibrahim, captured in April of 2013, to do everything necessary for their speedy release. 11. We lift our prayers to Christ, the Saviour of the world, asking for the return of peace in the Middle East, “the fruit of justice” ( Is 32:17), so that fraternal co–existence among the various populations, Churches and religions may be strengthened, enabling refugees to return to their homes, wounds to be healed, and the souls of the slain innocent to rest in peace. We address, in a fervent appeal, all the parties that may be involved in the conflicts to demonstrate good will and to take part in the negotiating table.In order to ensure a solid and enduring peace, specific efforts must be undertaken to rediscover the common values uniting us, based on the Gospel of our Lord Jesus Christ. 12. We salute the courage of those who gave their lives testify to the truth of the Gospel, preferring death to renounce Christ.We believe that the martyrs of our times, originating from different churches, but united by a common suffering, are the key to Christian unity. To you, the suffering of Christ, draws his word His Apostle: “Beloved, … As you are partakers of Christ’s sufferings, rejoice; that at the revelation of his glory rejoice with exceeding joy “ (1 Pet. 4: 12-13). 13. In this disturbing era of interreligious dialogue is needed. The differences in the understanding of religious truths should not hinder people of different faiths live in peace and harmony. In the present circumstances the religious leaders have a special responsibility for the upbringing of his flock in the spirit of respect for the beliefs of those who belong to other religious traditions. Absolutely unacceptable attempts to justify the criminal acts of religious slogans. No crime can not be committed in the name of God, “because God is not the author of confusion, but of peace” (1 Cor. 14, 33). 14. Testifying to the high values ​​of religious freedom, we give thanks to God for an unprecedented revival of the Christian faith, which is now going on in Russia and in many countries of Eastern Europe, where for decades dominated by atheistic regimes.Today, militant atheism the chains dropped, and in many places, Christians are free to practice their faith. For a quarter century, it erected tens of thousands of new churches opened hundreds of monasteries and theological schools. Christian communities are extensive charitable and social activities, providing diverse assistance to the needy. 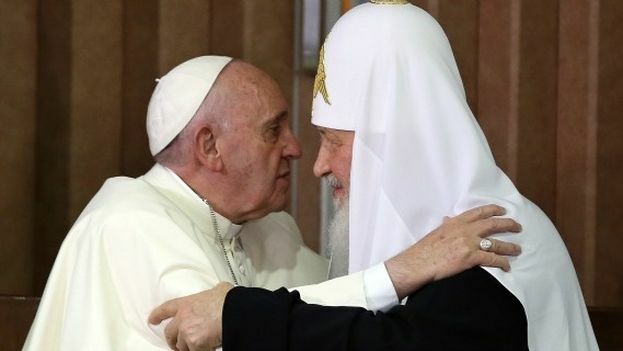 Orthodox and Catholics often work side by side. They defend the common spiritual foundation of human society, indicating the evangelical values. 15. At the same time, our concern is the situation evolving in so many countries where Christians are increasingly faced with the restriction of religious freedom and the right to testify about their beliefs, to live in accordance with them. In particular, we see that the transformation of some of the countries in the secularized society, alien to any memory of God and His righteousness, entails a serious threat to religious freedom. We are concerned about the current limitation of the rights of Christians, not to mention the discrimination against them, when some political forces, guided by the ideology of secularism, as often becoming aggressive, seeking to force them to the margins of public life. 16. The process of European integration that began after centuries of bloody conflicts, was perceived by many with hope, as a pledge of peace and security. At the same time, we warn against such integration, which does not respect the religious identity. Being open to the contribution of other religions in our civilization, we are convinced that Europe needs a loyalty to their Christian roots. We call on Western and Eastern Europe to unite Christians for common witness to Christ and the Gospel, so that Europe has retained its soul, formed by two thousand years of Christian tradition. 17. Our view is addressed to people who are in a difficult situation, living in extreme poverty and poverty in a time when the wealth of humanity grow. We can not remain indifferent to the fate of millions of migrants and refugees, knocking on the door of the rich countries. Uncontrolled consumption, typical of some of the most developed countries, rapidly depletes the resources of our planet. Growing inequality in the distribution of earthly goods increases the sense of injustice propagation, the system of international relations. 18. Christian Churches are called to uphold justice demands respect for the traditions of the peoples and effective solidarity with all those who suffer. We Christians should not forget that God “chose the foolish things of the world to confound the wise; and God hath chosen the weak things of the world to shame the strong; and the base things of the world and the despised and nothing meaningful, hath God chosen, yea, in order that no flesh should glory in His presence “ (1 Cor. 1, 27-29). 19. The family – a natural center of the life of man and society. We are concerned about the family crisis in many countries.Orthodox and Catholics, sharing the same vision of a family, called to witness to the family as a path to holiness, is faithful to the spouses in relation to each other, their readiness for the birth and upbringing of children, solidarity between generations and respect for the infirm. 20. The family is based on marriage as an act of free and faithful love between a man and a woman. Love strengthens their union, teaches them to accept each other as a gift. Marriage – is the school of love and fidelity. We regret that other forms of cohabitation is now equated with the Union, and hallowed tradition of the biblical notions of fatherhood and motherhood as a special vocation of man and woman in marriage are forced out of the public consciousness. 21. We call on everyone to respect the inherent right to life. Millions of babies are deprived of the possibility of the birth. Blood Voice of the unborn child is crying to God . (Gen. 4, 10). The spread of so-called euthanasia leads to the fact that the elderly and patients begin to feel an excessive burden on their families and society as a whole . We express our concern about the increasingly widespread use of biomedical reproductive technologies, for the manipulation of human life – it is an attempt on the foundations of the human being, created in the image of God. We consider it our duty to remind about the immutability of Christian moral principles based on respect for human dignity, which is intended to life, according to the plan of his Creator. 22. We wish to call today a special word for Christian youth. You, the young, should not bury our talent in the earth (Matt. 25, 25), but to use all the abilities God has given you for approval in the world of the truth of Christ, for the realization of the evangelical commandment of love of God and neighbor. Do not be afraid to go against the tide, defending the truth of God, which does not always conform modern secular standards. 23. God loves you and each of you expects you to be his disciples and apostles. Be the light of the world , that others, seeing your good works, glorify your Father which is in heaven (Matt. 5: 14-16). Nurture children in the Christian faith, give them the precious pearl of faith (Matt. 13, 46), which you have received from your parents and ancestors. Do not forget that “you are bought with a price” (1 Cor 6, 20.) – At the cost of death on the cross God-man Jesus Christ. 24. Orthodox and Catholics are united not only by a common tradition of the Church of the first millennium, but also the mission of preaching the Gospel of Christ in the world today. This mission involves mutual respect of members of the Christian communities, excludes any form of proselytism. We are not rivals but brothers: this understanding, we must proceed in all our actions in relation to each other and to the outside world. We urge Catholics and Orthodox in all countries learn to live together in peace, love and harmony with one another (Rom. 15: 5). You should not use improper means to force believers to move from one church to another, neglecting their religious freedom and their own traditions. We are called to implement the covenant of the Apostle Paul and “to preach the gospel, not where it was already known the name of Christ, lest I should build on another man’s foundation” (Rom. 15, 20). 25. We hope that our meeting will contribute to reconciliation where there is friction between the Greek Catholics and the Orthodox. Today it is obvious that the method “uniatism” of past centuries, involving the reduction of one community in unity with the other by its separation from his Church, is not the way to restore unity. At the same time, the ecclesial communities which have appeared as a result of historical circumstances, have the right to exist and to take all necessary to meet the spiritual needs of their faithful, striving for peace with its neighbors. Orthodox and Greek Catholics are in need of reconciliation and finding acceptable ways of mutual coexistence. 26. We mourn the confrontation in Ukraine, which claimed many lives already, the reason countless suffering civilians plunged society into a deep economic and humanitarian crisis. We call on all parties to the conflict to prudence, social solidarity and active peacemaking. We urge our churches to work in Ukraine to achieve social harmony and refrain from engaging in confrontation and not to support the further development of the conflict. 27. We express the hope that the split among the Orthodox believers in Ukraine will be overcome on the basis of the existing canonical norms that all Orthodox Christians of Ukraine will live in peace and harmony, and the Catholic community of the country will contribute to this, to our Christian brotherhood was even more obvious. 28. In the contemporary world, which is both multiform yet united by a shared destiny, Catholics and Orthodox are called to work together fraternally in proclaiming the Good News of salvation, to testify together to the moral dignity and authentic freedom of the person, ” That the world SO may Believe “( of Jn 17:21). This world, in which the spiritual pillars of human existence are progressively disappearing, awaits from us a compelling Christian witness in all spheres of personal and social life. Much of the future of humanity will depend on our capacity to give shared witness to the Spirit of truth in these difficult times. 29. May our bold witness to God’s truth and to the Good News of salvation be sustained by the Man-God Jesus Christ, our Lord and Saviour, who strengthens us with the unfailing promise: “Do not be afraid any longer, little flock, by Father is your for to pleased to give you the kingdom “( Lk 12:32)! of Christ is the a well-spring of the joy and hope. Faith in Him transfigures human life, fills it with meaning. This is the conviction borne of the experience of all those to whom Peter refers in his words: “Once you were ‘no people’ but now you are God’s people; you ‘had not received mercy’ but now you have received mercy “( 1 the Pet 2:10). 30. With grace-filled gratitude for the gift of mutual understanding manifested during our meeting, let us with hope turn to the Most Holy Mother of God, invoking her with the words of this ancient prayer: “We seek refuge under the protection of your mercy, Holy Mother of God “. May the Blessed Virgin Mary, through her intercession, inspire fraternity in all those who venerate her, so that they may be reunited, in God’s own time, in the peace and harmony of the one people of God, for the glory of the Most Holy and indivisible Trinity!